Argonics’ Speedy Sleeves are specifically engineered for ease of installation, access and maintenance. Our polyurethane will not corrode, remains pliable and is not susceptible to damage due to impact. 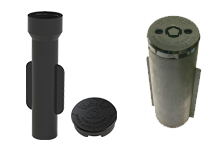 The patent-pending design provides an easy solution for accessing the shut-off rod; no more breaking lids or tapping pipes!